League of Women Voters of Pennsylvania – Empowering Voters. Defending Democracy. 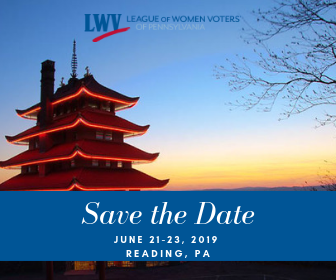 We are happy to announce that the 2019 LWVPA State Convention will be held in Reading, PA on June 21-23! Keep watching your emails and our website and social media for more details! Fracking Regulation in the Delaware River Basin! For the last decade, there has been discussion of the need to regulate fracking activity in the Delaware River watershed to preserve the quality of the water supply for 15 million people in the region. In line with LWVUS positions supporting policies to protect the environment, the Leagues of Delaware, New Jersey, New York, and Pennsylvania have called for a comprehensive ban on all fracking-related activities within the watershed, most recently testifying on the importance of such protections in 2018. In spite of overwhelming public support for protecting the watershed, no permanent safeguards have been instituted by the regional regulatory authority, the Delaware River Basin Commission (DRBC). Earlier this year, New Jersey’s Governor Murphy called upon DRBC to impose a full ban on all fracking-related activity within the basin, including the importation and processing of toxics-laden fracking wastewater. Governor Wolf has yet to indicate whether or not he will support this comprehensive ban although he has previously indicated support for regulation of the gas industry’s activities by DRBC. We believe Governor Wolf should join Governor Murphy in supporting a total ban on fracking-related activities in the region. Please contact governor Wolf asking him to support a complete ban on all fracking industry activities in the Delaware watershed, just as Governor Murphy has pledged to do. In the past, you have welcomed the Delaware River Basin Commission’s proposal to regulate fracking industry activity in the Delaware watershed in order to safeguard our natural resources and water supply. Now, we urge you to join New Jersey Governor Murphy in support of a new rule on fracking that would clearly ban all fracking activities within the watershed. This must include fracking itself; the export of water from the basin for use in fracking elsewhere; the importation of fracking wastewater; the processing, storage, or discharge of fracking waster or wastewater; and other fracking-related action such as, but not limited to, the use of wastewater brine loaded with toxics and radioactivity for deicing roadways. At stake is our ability to protect the region’s natural environment, ecotourism industry, and the quality of the drinking water used by more than 15 million people. Thank you for your past support of DRBC’s draft regulations. We now urge you to advocate for even stricter rules so that we may protect this critical watershed and the health of our citizens. On December 1, Fair Districts PA and LWVPA co-hosted the Reclaiming Our Democracy townhall at the PA State Museum in Harrisburg. It was a hugely successful event, with over 250 attendees. To view video of the event, check out Fair Districts PA's website! After months of hard work, we are excited to announce our new Election Law Position. We've updated and expanded the position to include open primaries, voter registration modernization, and alternative election systems. Check it out here! Improving our criminal justice system is an important priority of the LWVPA. Our members are dedicated to ensuring that our justice system should be fair to all and that everyone who becomes a part of the system should be treated with dignity. Learn more about the issue here. The League of Women Voters of Pennsylvania (LWVPA) is a grassroots citizen engagement organization dedicated to encouraging informed and active participation in government by all Pennsylvanians, working to increase understanding of major local, state, and national public policy issues, and influencing public policy through education and advocacy. The League never supports or opposes a candidate or political party yet helps voters to learn about government issues and candidates. TOGETHER WE MAKE DEMOCRACY WORK!